Description: Guardians are the most emblematic enemies of Breath of the Wild. They look like huge shooting turrets standing on six robotic feet. Their head can move all the way round, which is very useful for firing explosive beams with their tiny murderous blue eye. If you feel brave, you can take on the Guardians with your sword. You can cut their legs to make them lose their balance and turn them over. That way, you can take advantage of this moment to attack the Guardian, or even better, to rid it of all of its legs. As long as it has one leg left, the Guardian can move, but otherwise, it's nothing more than a decayed guardian. This method is quite complicated because the Guardians try to keep a good distance to fire at you, but you can stun them with an arrow in the eye before starting to hit the legs with a charged spin attack with a two-handed weapon. (Note: The Ancient weapons can cut the Guardians' legs in a single blow.). One of the most efficient methods to slay the Guardians consists in using a shield. If you manage to counter their laser by pressing A at the "perfect" moment, the shoot will be repelled straight at the Guardian, making it lose a third of its life. Repeat this twice and the Guardian will be destroyed! 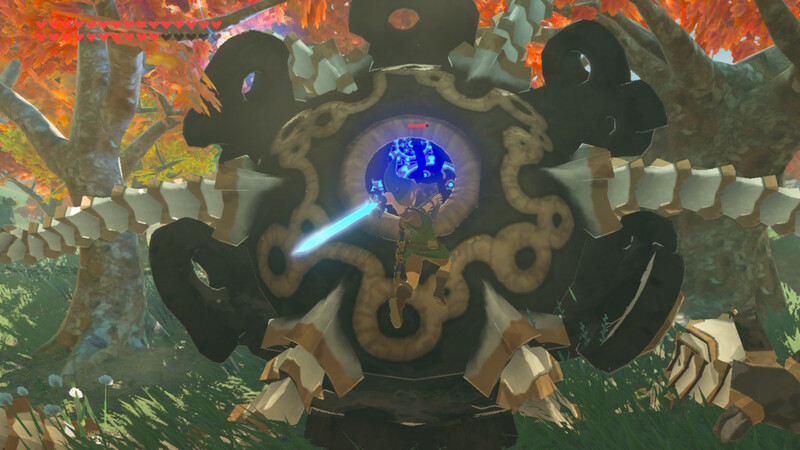 This method may be very efficient, it still asks for a very good timing, otherwise, it's highly probable that your shield will be destroyed by the Guardian's shoot (except from the Ancient Shields which automatically repel the shoots). 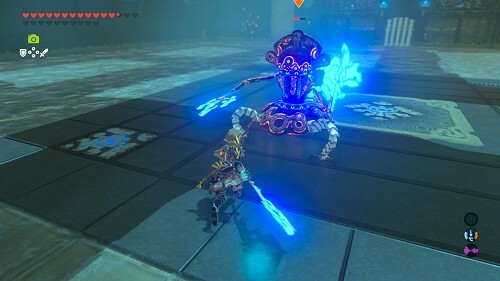 Daruk's Protection repels the shoots automatically, so if you have the three charges of this power, you'll surely defeat the Guardian. You can also vary your approach by attacking them with a bow. You can use Revali's Gale to take off in the air to shoot at them in a safer way. Otherwise, you can wait for the Guardian to fire over some grass if there are some nearby and use the hot wind current. The simplest method to defeat a Guardian is and will always be the Ancient Arrows. You can make some in Robbie's Lab in the Akkala region, all the way to the northeast, but they require lots of materials and rupees. An arrow can empty a third of a Guardian's life bar or, if it's aimed directly at its eye, destroy it in a single hit! I advise you to use bows such as the Korok ones, the Lynels ones or even Revali's one to be sure to get rid of them. A note from Max4081: Fighting off a Guardian Stalker on a horse at full-speed gives a strong advantage. As a matter of fact, the horse's speed boosts the damage for melee weapons and allows to destroy the Guardian's legs faster (a single blow from the Master Sword is enough to destroy a leg). 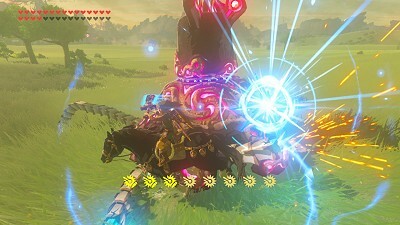 The horse is also good for turning the Guardian over very easily, by putting it on its head. This makes it unable to do anything for a while. Do note that the Master Sword deals twice as much damage to the Guardians, but it takes two hits from it to destroy a leg. Description: Guardian Scouts, as their name suggests, are replicas similar to the Guardians with a smaller built. They have a base looking like a circle standing on three robotic legs. Their round head may be crowned by one to three circular patterns depending on the Guardian Scout's strenght. They can also stretch vertically to reveal a cylindrical body as well as arms wielding Ancient Weapons (between one to three). 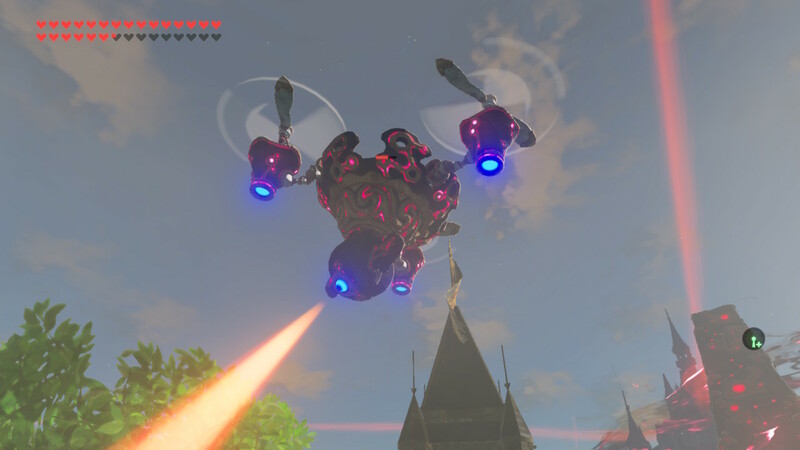 And of course, they also have this eye typical of Sheikah inventions. Their attacks: At the beginning of the fight, Guardian Scouts will approach you by trying to fire three small laser projectiles. Most of their attacks consist in attacking you with their laser weapons, meaning a lateral sword blow, a spear thrust or two big slow axe blows. They can also perform a back jump before rushing at you and spinning their weapons like a spinning top would. When their life goes down, they fire a laser on the ground while spinning round. And finally, when they're about to be defeated, they load up a three-time laser, which would make the Guardians proud. To defeat them: First of all, keep your shield up, the Guardian Scout may fire a round of three projectiles while approaching you. The rest of the fight is rather simple, you just have to attack the robot in close combat while avoiding its attacks. Dodge the side sword and spear blows (be careful since the spear is rather fast) and perform a backflip to dodge the huge axe blows that deal a lot of damage. Some Guardian Scouts hide behind some shields, you then have to either hit them enough for them to drop their guard, or to wait for them to do it on their own. If the Guardian Scout jump backwards and prepares a spin attack, hide behind one of the room's many pillars to stun the robot when it will dash at it. Some rooms don't have pillars; you'll either find some water on the ground, or some metal blocks stuck in the ground. So use Cryonis or Magnesis depending on the situation to get out of this predicament. You can also stop the attack by zapping the Guardian (arrows, rod, etc.). If your foe is getting ready to fire its beam by rotating its head, go far and wait for it to attack. A rising current will be generated and you'll be able to make use of it to take off and attack the Guardian Scout from the air. Finally, when the latter is short on life and is loading its most powerful attack, use a very powerful two-handed weapon and get rid of it before it can act! Description: The Guardian Skywatchers are like Guardian Stalkers which would have been flipped on their heads. They have three propelling blades which allow them to stay in the air. Their round head, that they use amongst other things to scan the ground with their eye, is less impressive than the Guardian Stalkers', but it doesn't make their skills any less dangerous. Their attacks: The Guardian Skywatcher, like its ground buddy, only fires deadly beams to a rather slow rhythm. However do note that it's easier to escape the latter's red pointer, because to the contrary of the Guardian Stalker, it won't chase you around, but rather tends to keep its position. You can try to defeat the Guardian with a bow. Attacking it directly will take a lot of time, so it's preferable to start by shooting at their blades. 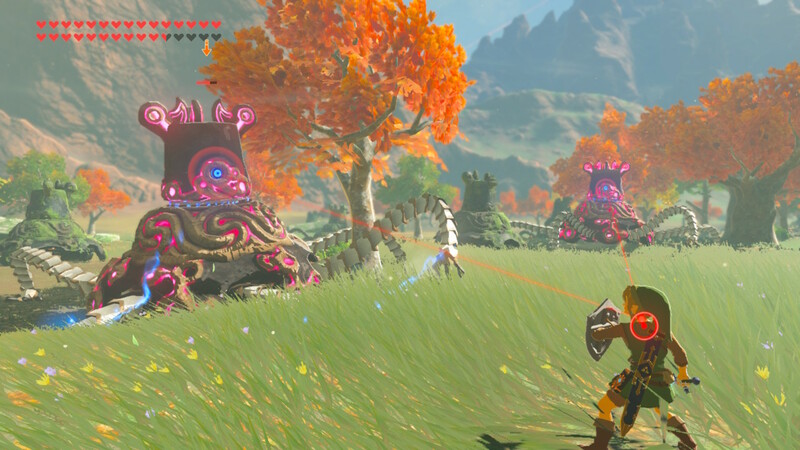 If you destroy one of them, it makes the Guardian sway, giving you enough time to prepare your second attack. You can also use a wind current or Revali's Gale to take off and thus touch the Guardian more easily. As soon as all the blades are destroyed, the robot crashes down and you can then calmly finish the fight with your sword. Ancient Arrows are as useful as ever on this kind of Guardian, but be more careful when you're aiming, since they tend to swing around. Then again a "x3" or "x5" shots bow is recommended to be as efficient as you can be. A note from Max4081: If you want to save your Ancient Arrows, you can use an Ancient Bow and two regular arrows to destroy a blade, or 3 Bomb Arrows with another bow. Thanks to Archanion and Mastroyal for their help!